Technology centered cities are on the horizon. With the announcement that a district in Toronto's waterfront will become the first in Canada to be built from the ‘internet up’, this is becoming more and more of a reality. Sidewalk Lab, a sister company to Google, recently announced that they are collaborating with Waterfront Toronto to re-invent the Queens Quay East area near Parliament. It is a 12-acre site that currently houses low-rise industrial buildings and parking lots. This will put Toronto on the map as a technology hub should they succeed in creating the first city with prioritized modern technology! With the help of contemporary technology, Sidewalk Toronto is hoping to solve the biggest city issues: creating complete communities, improving sustainability and resilience and fostering economic development. Their vision is to create pedestrian focused streets and innovation that will limit energy consumption, waste output and provide affordable housing. This all started with the Waterfront Toronto’s request for proposals. Sidewalk Labs submitted the winning proposal with city building concepts to improve quality of city life and make Toronto a new global technology hub. What does this mean for city dwellers and Toronto’s youth, in particular? For a millennial generation that is adept at technology, neighbourhoods like this will provide more opportunity to literally connect to our surroundings. Hopefully this neighbourhood will help to address the dilemmas youth today are likely to face in the future, such as affordable housing, mobility (e.g. getting around efficiently) and environmental sustainability. The hope is that technology can help us imagine, design, test, and build new urban strategies and architecture. These 12 acres of waterfront land will be a mixed-use community for inclusive use. This should mean that with or without disabilities everybody will be able to access all areas of the district. According to the RFP issued by Waterfront Toronto, at least 20% of the residential blocks will be designated affordable and will accommodate a range of income and age brackets. Hopefully this will help to solve the unaffordability issues that define Toronto’s real estate market! This 21-century neighbourhood will likely not be entirely accepted by all. As with any revitalization, there is bound to be gentrification. Luckily, the Queens Quay area right now is occupied by an abundance of parking lots, low rise industrial and office buildings. Many political factors will come into play as Waterfront Toronto is funded by all three levels of government. Additionally, this project will be expensive andSidewalk Labs provides little clarity on how they plan to execute this. Many question whether a tech company with a large team of primarily product designers and software engineers have the credibility to design a city. Their only notable and relevant urban planning project is LinkNYC which provided wi-fi kiosks to replace NYC’s payphones. Are they ready to design a new city typology? With so much technology, comes certainly heavy marketing opportunities. Should we be worried about a surveilled environment that sells user information? Will this new city be a way for whoever runs the district to monetize the way people use and live in urban spaces? Is Sidewalk Labs treating this as a research and development plan rather than a practical approach to building a community? Most news outlets are focused on the technology aspect of the project, dreams of self-driving cars, and robots that take care of waste. But we, the people who actually live, work and play in the city, must consider more than just the fancy frills of a new city! The first community discussion of the project was held on November 1st. Sidewalk Labs was introduced and there was a discussion about ideas, concerns, and hopes for the project. 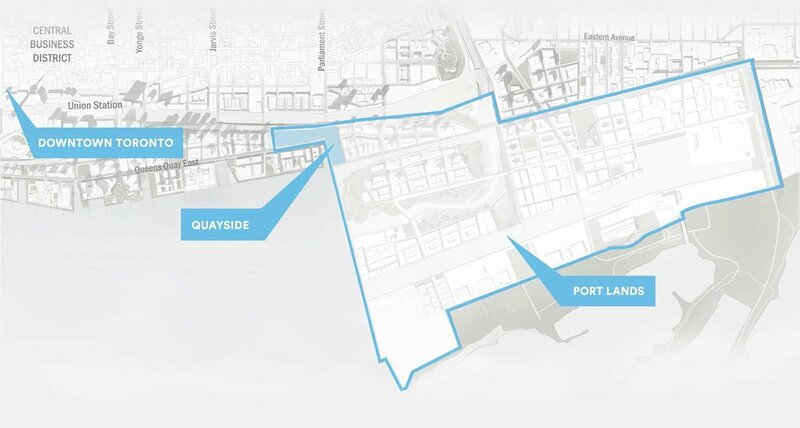 Sidewalk Labs appears to be confident they can achieve the goals and dreams of everyone (the citizens of Toronto primarily) in this new district. Public engagement is extremely important to the design process. Google’s office in Toronto is also looking to relocate closer to Quayside. The timeline for actual construction is uncertain. Sidewalk Labs’ proposal highlighted ideas and concepts, and not feasibility or massing studies. Sidewalk Labs and Waterfront Toronto even mention that if they are met with too much disapproval, the project could be entirely abandoned. There will be a $50 million dollar consultation and planning exercise before any guaranteed plans will proceed. Crystal is a recent graduate from the University of Waterloo School of Architecture, and is working full-time at a local architecture firm. She has immense interest, especially at the local scale, in urban issues and innovations. She is always looking to further her skills in research to hopefully gain critical insights in how to manipulate architecture into any design fields. Connect with her through email: cwjyung@edu.waterloo.ca, or follow me at https://www.tumblr.com/blog/cwj-yung!